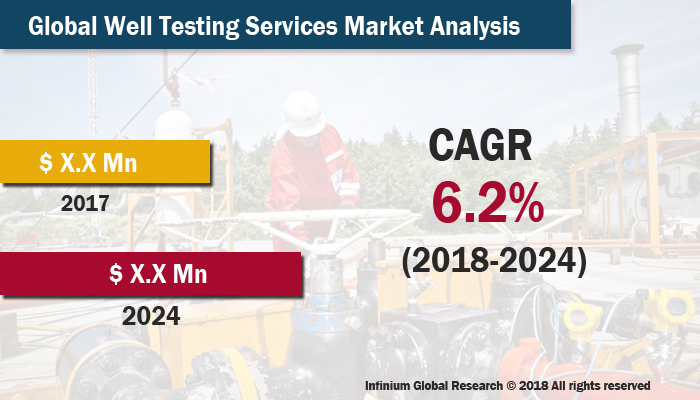 A recent report published by Infinium Global Research on well-testing services market provides an in-depth analysis of segments and sub-segments in the global as well as regional well testing services market. The study also highlights the impact of drivers, restraints, and macro indicators on the global and regional well testing services market over the short term as well as long term. The report is a comprehensive presentation of trends, forecast and dollar values of global well testing services market. According to the report, the global well testing services market is projected to grow at a CAGR of 6.2% over the forecast period of 2018-2024. In the oil and gas industry, the well test is the implementation of a set of planned data acquisition activities to reservoir characterization. The precise exploration and evaluation of well data that required to make critical reservoir management decisions. The well testing services provide an assessment of well, well cleanup and unloading, plug recoveries, inline production tests, and extended well testing. The well testing helps to improve the production and maximize recovery while curtailing environmental impact. The well testing enlightens the attributes of a well so that it can be operated profitably and efficiently. The Well Testing services also include the testing of Multiphase Flow Measurement, Surface Sampling, Production Testing, and others. The well testing offered various benefits including online gathering relevant reservoir data, optimize field performance, real-time diagnose of production problems and many others. The demand for energy is rising globally as emerging countries continue to consume massive amounts of energy. The rising demands of energy across the world are driving the growth of well services market. In addition, the oil and gas industries started to increase their efficiency with the introduction of the next generation technologies in their production. The growing production of oil and gas is expected to contribute in the growth of well testing market. Furthermore, the benefits offered by the well testing services are likely to boost the demand for well-testing services market. However, the fluctuations in the Crude Oil Prices is hampering the growth of the well-testing market. Moreover, growing demand for well-testing services in the Emerging countries and Rising popularity of Real-Time Well Testing Service are expected to create several opportunities in the well testing market. Among the geographies, North America holds the maximum share in the well testing services market owing to the growing shale activities in the U.S. The presence of various oil and gas industries and high spending in the energy sectors are contributes in the growth of well test service market in the North America region. In addition, the Middle East and Africa is the fastest growing region in the well testing market. Increased drilling activity and the rapidly growing Energy and power industries are driving the growth of well testing market in this region. The Asia Pacific region also shows the significant growth in the well testing market owing to the rising in the development and maintains expenditures in the energy and mining industries. The report on global well testing services market covers segments such as services and applications. On the basis of services, the global well testing services market is categorized into real-time well testing service, surface well testing service, downhole testing service, and reservoir sampling service. On the basis of applications, the global well testing services market is categorized into onshore, and offshore. The report provides regional analysis covering geographies such as North America, Europe, Asia-Pacific, and Rest of the World. In this section, the key trends and market size for each geography are provided over the period of 2016-2024. The countries covered in the North America region include the U.S., Canada, and Mexico; while the Asia-Pacific region includes countries such as China, Japan, India, South Korea, Malaysia, and among others. Moreover, Germany, U.K., France, Spain, and Rest of Europe are the major markets included in the European region. The U.S. drives the growth in the North America region, as it is the largest market in the region. In the Asia-pacific region, rapid industrial growth in India and China offer a substantial potential for the growth in the well testing services market. As a result, the APAC region is projected to experience a growth at a CAGR of x.x% over the forecast period 2018-2024. The report provides profiles of the companies in the global well testing services market such as Expro International Group Ltd, Schlumberger Limited, Halliburton Company, FMC Technologies Inc., Mineral Technologies Inc., Tetra Technologies Inc, Helix Energy Solutions Group Inc., MB Petroleum Services LLC, Weatherford International Ltd., and Rockwater Energy Solutions Inc. The report provides deep insights into the demand forecasts, market trends, and micro and macro indicators. In addition, this report provides insights into the factors that are driving and restraining the global well testing services market. Moreover, The IGR-Growth Matrix analysis given in the report brings an insight into the investment areas that existing or new market players can consider. The report provides insights into the market using analytical tools such as Porter's five forces analysis and DRO analysis of well testing services market. Moreover, the study highlights current market trends and provides forecast from 2018-2024. We also have highlighted future trends in the well testing services market that will affect the demand during the forecast period. Moreover, the competitive analysis given in each regional market brings an insight into the market share of the leading players. This report will help manufacturers, suppliers, and distributors of the well testing services market to understand the present and future trends in this market and formulate their strategies accordingly.